The Tobey/Slater/Blair/Crawford series retains the hallmark characteristics that have always made the text so easy to learn and teach from, including a “building block” organization. Each program builds essential skills and conceptual understanding by breaking the mathematics down into manageable pieces. The new editions address the latest trends and dynamics related to developmental mathematics course structures, including helping students gain a stronger conceptual understanding, while contextualizing the math. Instructors will find the inclusion of new conceptually oriented Guided Learning Videos with the accompanying Video Workbook with the Math Coach (in MyMathLab), plus a new emphasis on Career Explorations throughout the text and MyMathLab course to help students explore potential career paths. The Tobey series is flexible, and well-suited for a variety of classroom formats, including lecture-based, computer-lab based (modular and/or self-paced), hybrid, and online. MyMathLab® is an online homework, tutorial, and assessment program designed to work with this text to engage students and improve results. Within its structured environment, students practice what they learn, test their understanding, and pursue a personalized study plan that helps them absorb course material and understand difficult concepts. For this edition, the MyMathLab course includes new Guided Learning Videos and an updated and expanded Video Workbook with the Math Coach. John Tobey received his BA in mathematics from Wheaton College in Wheaton, Illinois, in 1965, his MA in mathematics education from Harvard University in 1966, and his PhD in mathematics education from Boston University in 1980. He has taught in the mathematics department at the United States Military Academy at West Point and served as the Mathematics Department Chairman at North Shore Community College in Danvers, Massachusetts, for five years. John has served as the president of the New England Mathematics Association of Two Year Colleges. He has received the NISOD award for outstanding teaching from the University of Texas at Austin. 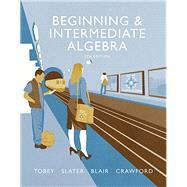 John is the author of seven mathematics books published by Pearson Education. John has spoken to many mathematics departments and at many professional meetings throughout the country on the topic of developmental mathematics education and distance learning in mathematics. He lives in Massachusetts. Jeffrey Slater has been a professor at North Shore Community College for thirty-eight years and received the Teacher of the Year award in 2002. Jeff travels around the country speaking on student retention and is also a consultant to the Federal Government. He lives in Lexington, Massachusetts, with his wife Shelley and his yellow lab Gracie. Jamie Blair has directed the Mathematics Learning Center at Orange Coast College for the past seventeen years. She designed, developed, and implemented the center, and as a result of this effort, has provided technical expertise related to the particulars of the Math Center to numerous other two-year colleges and at many conferences. In 2007, Jamie was appointed to the Team of Basic Skills Specialists by the California State Academic Senate. She is also currently participating on Title 3 committees on her campus. She specializes in teaching students who have never been successful in mathematics. She is an expert in the area of basic skills in relation to the learning needs of students. She lives in California. Jennifer Crawford received her BS in mathematics from the University of Minnesota–Duluth in 1995 and her MS in mathematics from the University of Minnesota–Twin Cities in 1998. She taught a wide range of courses at North Shore Community College in Danvers, Massachusetts for five years. She currently teaches at Normandale Community College in Bloomington, Minnesota, where her focus is working with developmental math students. She lives in Minneapolis, Minnesota, with her husband, two young children, and black lab.